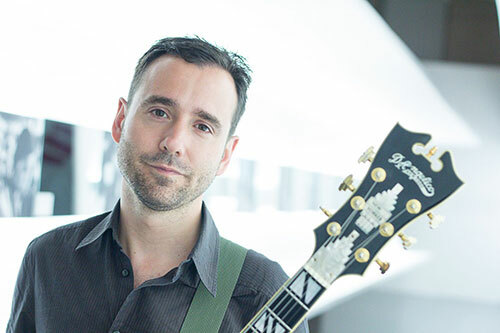 Spanish jazz guitarist Albert Vila is bringing his fresh and modern sound to Selkirk College in Nelson. A native of Barcelona, Spain, Vila has just embarked on his first Canadian tour performing music from The Unquiet Sky recorded in New York City with Aaron Parks, Jeff Ballard and Doug Weiss. He will play at the Shambhala Music & Performance Hall on Monday, October 3, 7:30 p.m.
Jazz guitarist Albert Vila will play at the Shambhala Music and Performance Hall on Monday, October 3, 7:30 p.m.
His previous albums, Foreground Music, Tactile and Standards were warmly received by both the public and critics, as is his latest release. “There's no standards, no ballads and no bebop here but that's what makes Albert Vila's The Unquiet Sky so special as the guitarist and renowned crew, forge an impressive well-designed escape from the traditional side of jazz in favor of exploring the more creative and challenging aspects of modern music," writes Edward Blanco at www.allaboutjazz.com. Vila studied at the Taller de Musics in Barcelona, the Conservatory of Amsterdam with Jesse Van Ruller and at the prestigious Manhattan School of Music on scholarship. He completed the graduate program in New York City studying with Rodney Jones, Dave Liebman and Phil Markowitz. Having the mentorship of such strong musicians has led Vila to teach while performing as well. In 2015, he did so at the International Jalisco Jazz Festival in Mexico. Selkirk College Voice and Ensemble Instructor Laura Landsberg is excited to welcome the musician to her class and to the performance hall. Tickets are available at the door for $15 and $10 for students. Doors open at 7 p.m. Learn more about Contemporary Music & Technology Program at Selkirk College and join us on Facebook.